Faultless® is a registered trademark of Albion Industries. *Faultless ® is regsitered with the U.S. Patent and Trademark Office Global Caster does not represent themselves as an authorized Faultless® distributor. Kingpinless addition which offers even more versatility to our heavy-duty offering with the same top plate dimensions and overall height as our KP1400 and 1400 Series. The horn assemblies are rated at 1,500 lbs., making this series perfect for numerous commercial applications. Features a single ball raceway comprised of a forged top plate and swivel assembly. They are secured with 1/2" diameter balls in 3" diameter precision machined raceway that is induction hardened. 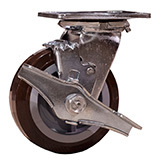 This popular caster is designed to handle many combinations of wheel diameter and width combinations for many load situations. Brakes: Optional thumb screw brake available on some items. *Disclaimer: Global Caster Corporation does not represent itself as an authorized Faultless® distributor.